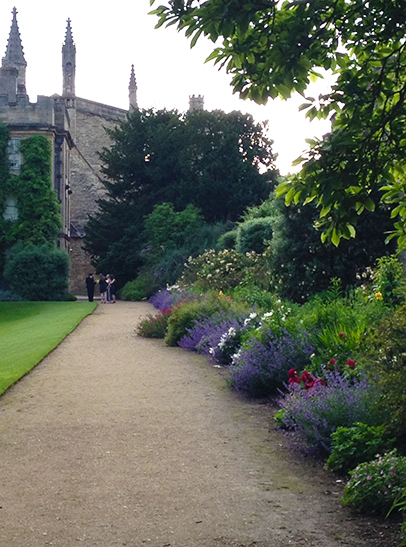 This week I was lucky enough to taken for a tour by Robin Lane Fox around the gardens he has created at New College, Oxford. What a treat it was. Wordsmith extraordinaire, he brims with erudition, joie de vivre and great passion for many things including gardening. “Zeus has heard me” he began, as we looked up at the grey skies and entered other-wordly quadrangles. I savoured his every word – often outspoken and always of very firm opinion. “I’m no fan of Eurograsses! Borders should be like a good supper.... at least four courses to enjoy... Never declare all your hand at once... there should always be succession of changes, including colour.... Sometimes you have accidental successes... Do not plant in blocks, more in lines...” and so it continued until the skies started to deepen grey and champagne was offered. His planting reflected his spirit – flamboyant yet classical, surprising, witty and riotously enjoyable. Also a devotee of Nancy Lancaster, he can’t go wrong in my mind. His book, Thoughtful Gardening: Great Plants, Great Gardens, Great Gardeners, is one of the best books I have come across recently.